Top 10 Bizarre Weapons of War in 20th Century include X-Class Midget Submarines, V-3 Supergun, Sonderkommando “ELBE”, Ohka (Cherry Blossom) Suicide Plane, Anti-tank dogs, Bachem BA349 Natter Fighter, Bat Bombs, Pigeon Guided Missile, Project Habakkuk and Silbervogel (Silver Bird) Bomber. Top 10 Military Machines of War: It is often said that necessity is the mother of all invention, and at no other point in a country’s history is necessity greater than in war-time. As a result, the widespread, and often desperate, fighting led to many new inventions, from computers, to jet engines, to atomic bombs. However, many of these inventions were downright bizarre, and this list aims to explore the inventions which have been lost to the annals of history. Of course, there are far too many of these strange weapons to be included in a single list, so feel free to mention any additional ones you feel should be on this list in the comments. The brutality of war can be reflected by the means with which it’s fought. Anti tank dogs were a soviet creation, and said to have taken down over 300 German tanks during World War II. Dogs were taught to find food under tanks, and then starved before a battle. They would have bombs strapped to their backs, with levers that would trigger as soon as it hit the underside of a tank. When the lever snapped back, the dogs would explode, destroying the tank. The Germans eventually fought this tactic with flamethrowers, and a couple cases of dogs running amok away from battlefields was enough to cut back the program. Corkscrew tanks didn’t run on the typical caterpillar type treads, instead propelled by giant corkscrews. Just like an electric screwdriver pulls into a piece of wood, so these treads would cruise along the ground, regardless of terrain. Their travel was a bit erratic, and the tanks had to be too lightweight to be useful in combat. When it comes to urban fighting, every corner can hide a group of enemy soldiers. Even the slightest advantage can win battles, so various weapons were designed to allow soldiers to see around corners, and fire around them behind the protection of a concrete wall. The Tsar tank was Russian built with two wheels 27 feet in diameter that pulled a much smaller set of wheels behind. Mounted with large and heavy guns, it was one of the few tanks that didn’t have treads, and was designed to overrun any obstacle. The design was bulky and ill conceived for the reality of battle, and was quickly dropped. Barrage balloons were strung up by the hundreds over cities during World War II. Like floating mines, they would make it difficult for low flying enemy aircraft to make devastating bombing runs by threatening to bring them down with their taut wires and incendiary devices. With the scarcity of metal toward the end of World War II, Project Habbakuk was an attempt to create aircraft carriers out of pykrete, a mixture of ice and wood pulp. Thick enough to withstand enemy fire, and easily repaired, pykrete would enable the construction of large ships with the uses of minimal resources. The war was completed before any of these ships became a reality. 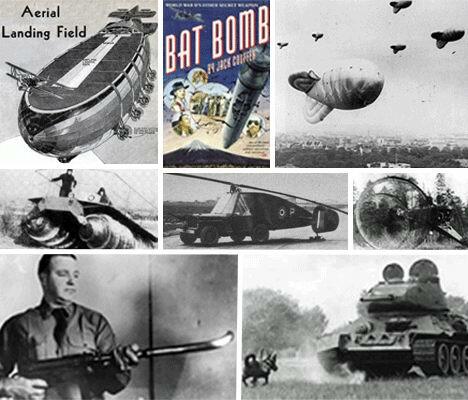 It’s surprising a prototype of a bat bomb was ever even made, but it was. The idea was simple: place incendiary explosive devices on Mexican Free-Tailed Bats, lower their temperature inside a bomb so they hibernate in transit, and then release them over an enemy city to roost in the infrastructure below. At a specific time, all the bats would explode in a thousand fiery blazes, igniting fires across the city. The Goliath tracked mine was a remote controlled anti tank mine that carried nearly 200 pounds of explosives and would be steered toward enemy troop or tank formations and detonated. These mines were created by the Germans and used throughout World War II, on all fronts, and were known as beetle tanks by Allied forces. The flying jeep was created to fulfill a contract to create a lightweight helicopter that could be landed in any terrain. Several prototypes were created but they never went into full production. No matter how good it looked on paper, the flying jeep’s goofy appearance gives a good indication of why such a flimsy hybrid would not do well in the heat of battle. Flying aircraft carriers had a brief stint in the collective imagination of a wartime populace. Much like hoverpacks and flying cars, the idea never came to fruition, only to live on in steampunk style novels and shows. They would be easy to shoot down, consume inordinate amounts of fuel, and had few advantages to counter an extended list of cons. Silbervogel (Silver Bird) Bomber: This was probably one of the strangest and most radical weapons Germany proposed during the Second World War. It was a candidate for the ‘Amerika Bomber’ initiative, which attempted to develop a bomber which had the range to attack mainland America. It was based upon the idea of placing a plane on a 3 km (2 mile) long rail, which would be propelled to 1900 kph (1200mph), by a rocket-powered sled. Once airborne, the Silbervogel would then fire off its own rocket engines to propel it to a height of 145km (90miles), traveling at 22100 kph (13700 mph). It would then slowly descend into the stratosphere, where the flat body of the plane would generate lift due to the increasing air density. This would cause it to rise again, and the plane would progress around the world in a series of ever shallower ’bounces’. It would then deliver a 4000kg (8800lb) bomb (possibly radiological) to somewhere in America, before landing at a Japanese base in the Pacific. In the end, the project was far beyond the capabilities and resources of Nazi Germany, and only existed as a mock-up. Project Habakkuk: Project Habbakuk was the name of an ingenious project thought up by Geoffrey Pyke. He envisaged that by taking a large iceberg of ice floe, levelling off the top, and hollowing out the inside, it could be used as a landing platform for aircraft. At the time, the Allies were losing huge numbers of supply ships to German U-boats in the Atlantic. Aircraft were extremely adept at hunting and destroying surfaced U-boats, but they lacked the range to cover the entire Atlantic. Providing a landing platform in the middle of the ocean would therefore give the U-boats nowhere to hide. However, ice proved unsuitable as it split easily, and icebergs themselves are prone to rolling over. Fortunately, two scientists in New York soon discovered that by freezing water with wood pulp, they could create a strong but buoyant substance they christened pykrete. The final design called for a giant carrier 600m (2000ft) long, built out of pykrete, fitted with an extensive cooling system to prevent the pykrete melting, displacing 2.2 million tons, and carrying 150 planes. Unfortunately, research was halted in early 1944 for a number of reasons: the growing numbers and effectiveness of conventional carriers, the huge cost ($100 million) involved, and the technical difficulties of building and refrigerating such a massive structure.